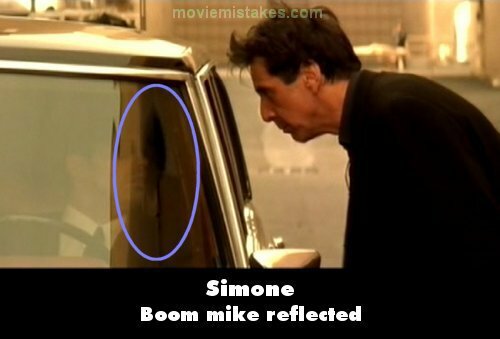 Revealing mistake: Near the end of the movie, Al Pacino has been arrested and is in a cage. When he demands to be let out, he grabs the cage and it wobbles, showing it's not fixed to the ground. Continuity mistake: At the end of the movie we see Viktor sitting on the couch with Simone. Watch closely at the very end, he puts his hand directly on the couch. This would have caused it to appear to the audience to go through Simone's leg. Winona Ryder's onerous contractual stipulation about her being provided a bowl of Mike 'n' Ikes with the cherry ones removed was based on the rock band Van Halen's actual contract, which contained a similar clause about green M&Ms. Its purpose was to ensure that the rest of the contract would be followed to the letter.